Now Commuters are able to get info on the route, stations, fares, and trip duration. KOCHI (Metro Rail News): The Kochi Metro Rail Limited tie-up with Google Maps to share information with the common person on April 12, 2019. Now Google Maps will be able to get information about the Kochi metro route, stations, fares, halt timing at each station, and the duration of the trip. Prior to this, Google maps in Kochi used to show only recommendations based route map. Now The public transit options metro will be included. The initiative was inaugurated here by KMRL managing director A.P.M. Mohammed Hanish. “The foray of the Kochi metro into Google Maps will benefit users immensely as they can view the timing of trains at each station and the expected time is taken for a trip. This is a continuation of KMRL’s open-data initiative. Because of the availability of authentic information on the widely used Google Maps, commuters can have better-informed travel, and so, we expect more commuters to our system,” he said. 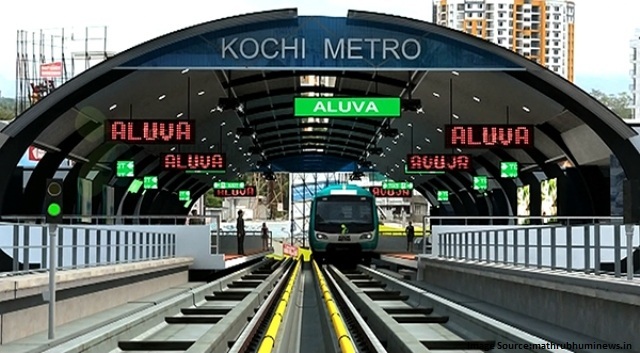 Kochi Metro became the first metro agency in India to launched the metro schedule and fare information in General Transit Feed Specification (GTFS) format and to adopt the open-data approach. It is a format through which transit data can be consumed by a wide variety of software applications. KMRL was in discussions with Google to integrate metro information on Google Maps which is the most used map application for trip planning. After meeting the procedural requirements, the KMRL-GTFS feed is now live on Google maps. This will enable Google Maps to give better commuting recommendations to users. Through the initiative, KMRL joins other metro agencies like Delhi Metro Rail Corporation and Bangalore Metro Rail Corporation to push transit data to Google Maps.